The heroes of “The New Musical Hamlet” which is a 3-country-joint project musical including Korea, Broad Way and Prague, were decided. The heroes are musical actor Park Kun Hyung (aged 31), crossover tenor Im Tae Kyung (aged 35), singer and actor Lee Jee Hoon (aged 29), singer and musical actor Yoon Hyung Ryol (aged 25). On June 12th, the production company “Spell Entertainment” announced that they cast 4 actors who have both singing ability and outstanding look for “The New Musical Hamlet,” which will begin the performances in August. 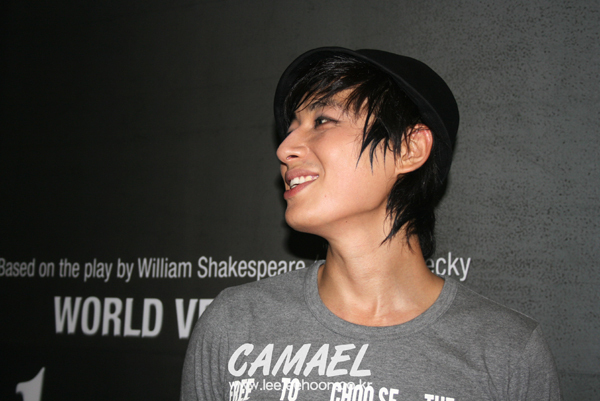 Park Kun Hyung has been active not only in the musical ‘Saturday Night Fever,’ but also in movies and TV dramas. 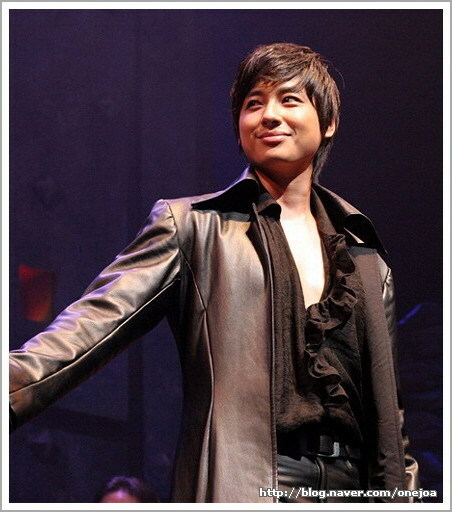 Im Tae Kyung showed off opulent sensitivity and expression power in musicals ‘Sword of Fire,’ ‘Jesus Christ Super Star,’ etc. Lee Jee Hoon, who was on the stage for the musical ‘Altarboyz’ in 2006, is busy acting in KBS 1TV daily drama, ‘You Are My Destiny,’ and singing his new songs as he released his 6th album. Yoon Hyung Ryol is the hero of musical ‘Notre Dame de Paris.’ He was awarded ‘a new musical actor’ and ‘a popular actor chosen by netizens’ in the second ‘the Musical Awards’ this year. Spell Entertainment expected, “The musical Hamlet has been recognized for its fine works with its powerful rock music and its fast tempo and people from three countries are participating in producing, so the musical Hamlet will be reborn as a world version. ‘The New Musical Hamlet’ will be performed as open-run (the closing of the musical depends on the audience / box-office record ) at ‘Theater S,’ which is a theater exclusively for musicals and is located in Chongpa-dong, Seoul, from August 21st. Wow good news for Jee Hoon I think it's going to be an excelent musical, so good for him to has a lot of work great info geez!!!! Subject: 뮤지컬 "햄릿" 관련 안내사항입니다!! 첫공연에 관련된 소식을 손꼽아 기다리고 계실거라 생각합니다. 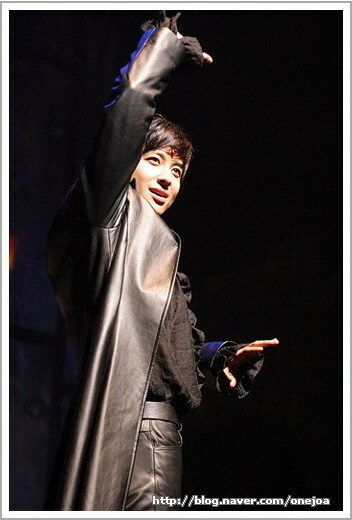 performance in the Hamlet musical! has not been confirmed yet. 예정된 계획만이라도 최대한 미리 카마엘 가족들에게 알려드리고자 합니다. family the confirmed information as quickly as possible. 이지훈님은 드라마 스케줄 관계상 프리뷰 공연에는 아쉽게도 참석하지 못하십니다. to participate in the Preview performances. 그 후 8월 29일 뮤지컬 "햄릿" - Special Night 본 공연 전야 행사가있다고 합니다. prior to the opening of the actual musical performances. 이때 최대한 스케줄을 맞춰 참여하실 수 있도록 노력중이시라고 하네요. 하지만 이날의 공연은 단체관람신청이 불가능한 상태이구요. we will be able to request tickets together to attend as a group. everyone will need to request tickets individually for the Special Night event. 뮤지컬 "햄릿"의 1차 티켓 오픈은 7월 30일로 예정되어 있습니다. The first ticket offering for the "Hamlet" musical is planned for July 30th. 이때 8월 21일 첫공연부터 9월 21일 공연까지의 좌석이 오픈됩니다. August 21st through the September 21st showing will be available. 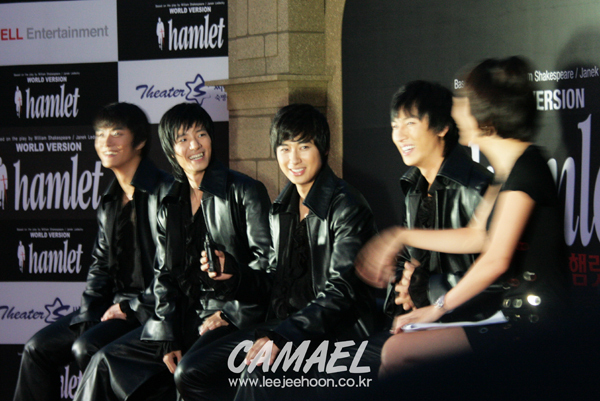 Sunday, September 14, 2008, at 2 p.m. and 6 p.m.
2008년 9월 17일 수요일 오후 8시입니다. 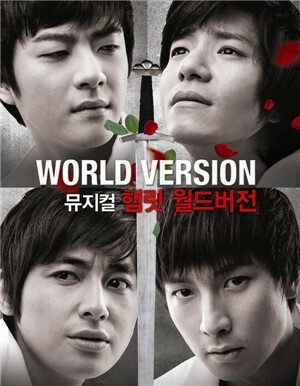 Wednesday, September 17, 2008, at 8 p.m.
주말 금토일 - R석 77,000원/ S석 44,000원 입니다. 단체관람은 최소 20명 이상일때 가능하며 20% 할인된 가격으로 진행됩니다. 새로운 공지사항을 통해 단체관람 선착순 신청을 받도록 하겠습니다. Please take note of the above information. Subject: 뮤지컬 "햄릿" 단체관람 신청해주세요!! 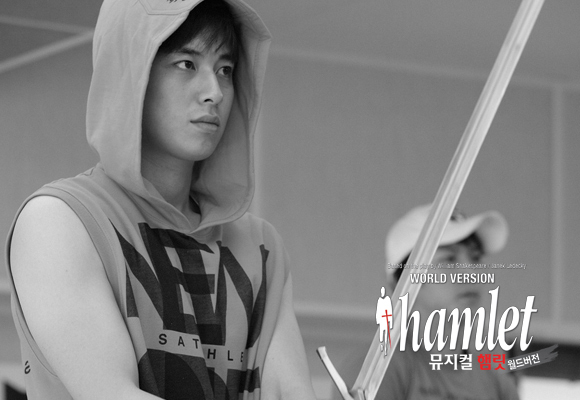 Please request Hamlet musical group tickets!! 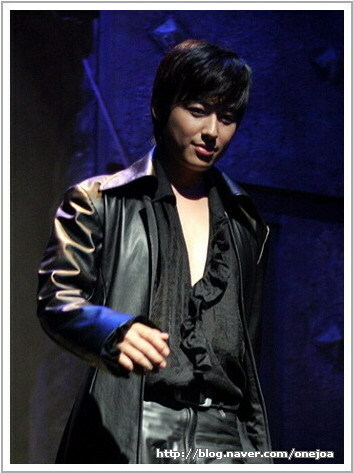 Lee Jee Hoon's first performances on 9/14/2008, Sunday 2 pm & 6 pm. VENUE: Sook Myung (Women's University) Art Center "THEATER S"
followed by your timely FEE/FUND DEPOSIT → and your timely FEE DEPOSIT CONFIRMATION EMAIL to Camael. ex) Kim Kyung Hee / Choi Ju Hee, Shin Jee Young / 2 p.m., 6 p.m.
*NOTE: if some people in your group are 10th members and some are not, please indicate for each member!! WHEN TO EMAIL: From August 5, 2008, Tuesday, 10 a.m. to August 7, 2008, Thursday, 12 a.m. Midnight. 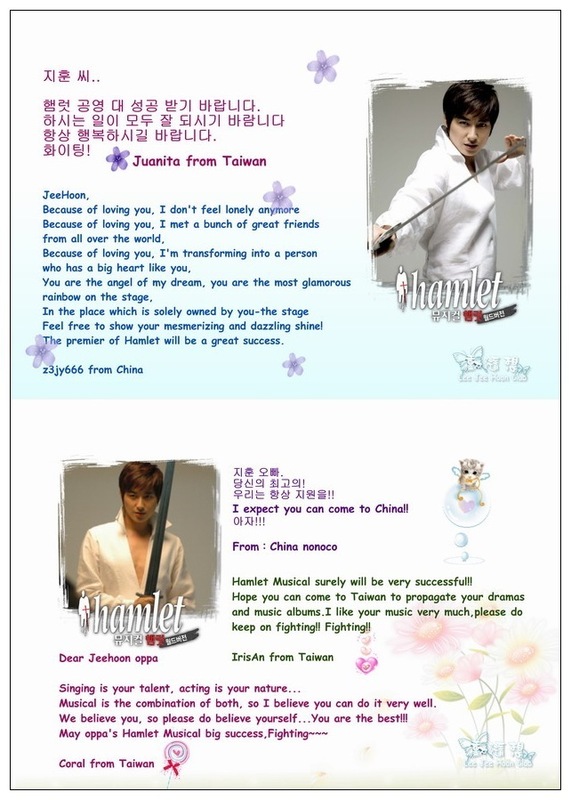 JeeHoon's the most handsome Hamlet! This is JeeHoon in the Musical HAMLET AD. The time-honored tale of Hamlet has been reborn as "The New Musical Hamlet" in a powerful rock opera style. The product of a collaboration between three production companies based on Broadway, in Prague and in Seoul, the story is based on the original Shakespeare work, yet is presented in modern form to stimulate 21st century audiences. Korean actors Lim Tae-kyung, Park Geon-hyung, Lee Ji-hoon, Yoon Hyung-ryeol have been cast in the leading roles in this open run production. Cost: tickets range from 44,000 won to 77,000 won. 2 and 6 p.m. on Sundays and holidays. Venue: Sookmyung Art Center, theater S.
Info: (02) 715-6358 (may not be an English-speaker available). Website is in Korean only. For more information, contact 1330 (02-1330 from cell phone) and they will look up the information you need. Hi! 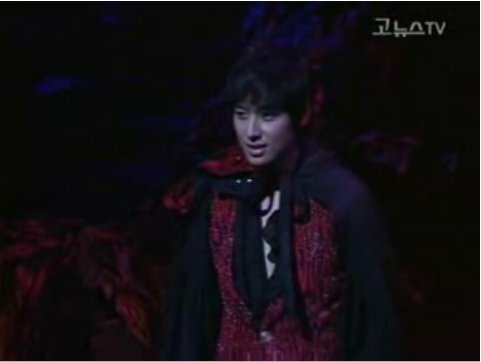 This is a performance & report clip of the Hamlet "Special Night" on 29 Aug 2008, from Go News TV. We thanked Wing (a big hug from us) who was ill recently but still managed to do this special clip for all his fans. Please enjoy and clap for our charming "Hoon-Let"!!! 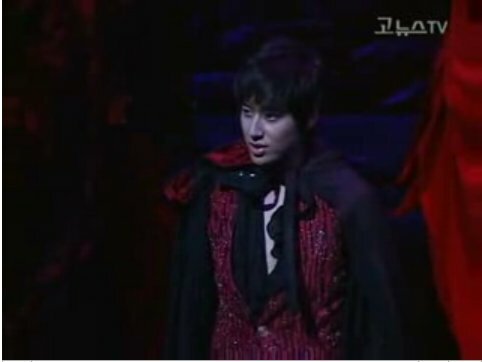 More video clips on Musical Hamlet "Special Night"
The singer and actor, Lee Jee Hoon, who was cast as a hero of the musical Hamlet, will be on his first formal stage. 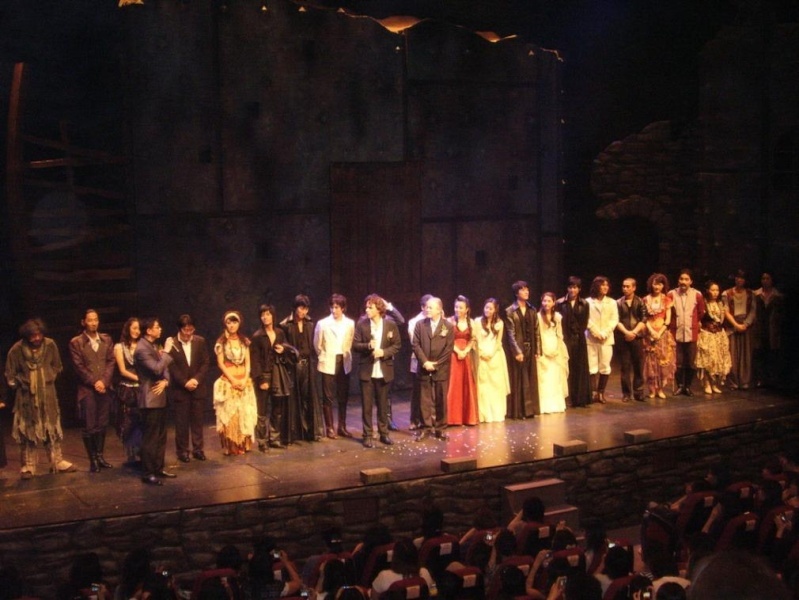 The musical Hamlet, which has been on the stage on open run at theater S in the SookMyung Art Center since late last month, is being loved by many women audiences as Park Kun Hyung, Lim Tae Kyung, Yoon Hyung Ryol are appearing as Hamlets. Lee Jee Hoon is more active than anyone else in 2008 with shooting the KBS 1TV daily drama, You Are My Destiny and singing activities after releasing his sixth album and now he is showing himself as a further upgraded entertainer by being on the musical stage. 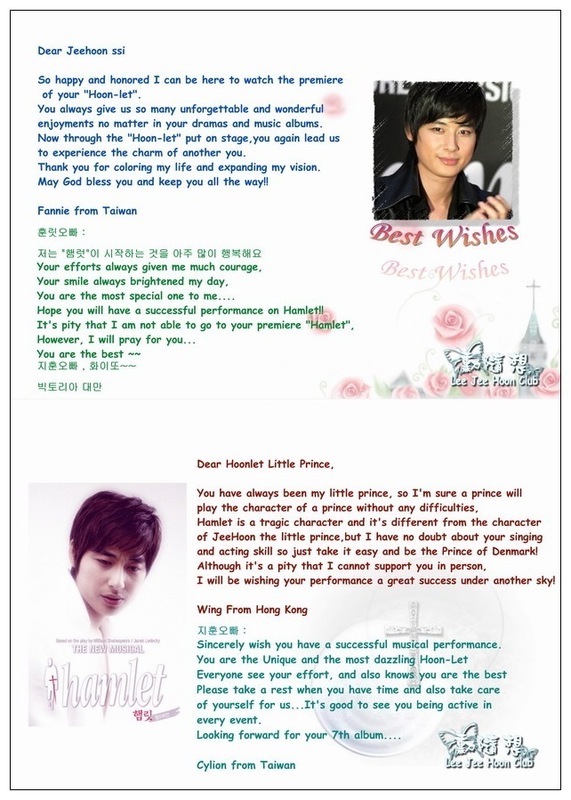 A producer of the musical Hamlet, Wang Yong Bum said, Lee Jee Hoon makes us feel sorrowful all the more because he has prince-like looks so much. I have found Lee Jee Hoon has grown up as an actor whose acting sense gets better and who is good at expressing thoughts after piling up his acting career since musical 'Altarboyz.'" Musical Hamlet is a work which needs much practices due to intense fencing scenes as well as the singing range that is hard even for the best musical actors. It is true that Lee Jee Hoon didnt participate in the early practices because of the drama shooting and many other TV programs. 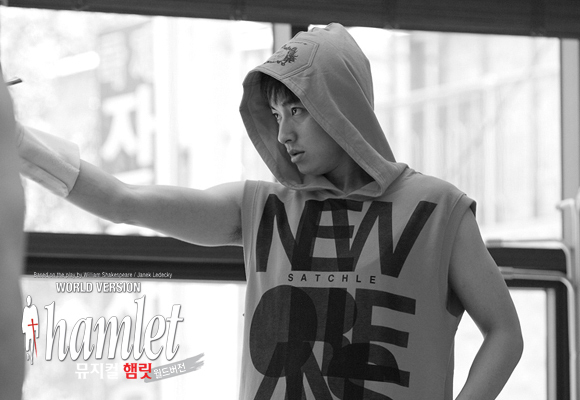 Now at rehearsals ahead of the performances, however, Lee Jee Hoon is showing the hero Hamlet which does never fall behind in comparison with other Hamlets played by other actors. He is presenting the outcome of his underneath great efforts so far. As Lee Jee Hoon, who has been doing his best from a singer with outstanding singing ability to an actor whose acting is recognized, I am looking forward to seeing his another characteristic on the musical stage. OMG! our prince is so highly praised! Thanks for sharing this - I love it! All his great efforts are recognised and prayers are being answered. So happy for him. I am very sure that it's going to be a really spectacular performance! 오늘 공연도 성공적으로 잘 마무리 되었습니다. Today's performance was also a big success! 소녀시대분들과 오라버니의 절친 강타씨 혜성씨를 뵐 수 있었네요. 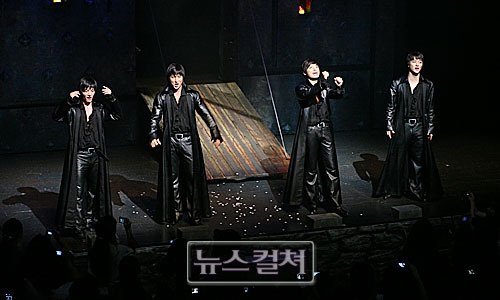 Anyway, Kangta ssi entered the theater in military garb and a little afterwards, Shin Hyesung ssi entered as well. 시원시원한 고음이 바깥에서도 잘 들리더라구요. The start of the musical!! Anyway, the musical went well and I waited outside for our Camael family who I'm sure were moved deeply, and for our oppa. 이럴 줄 알았음 단관을 진행해도 나쁘지 않았을텐데 아쉽더라구요. There were more people that came than I had imagined. Had I known that this would be the case, it would have been good to get group tickets...and I felt regretful. 오늘은 공연 후 배우들과 스탭들의 회의가 있었던 모양이예요. 미리 거둬뒀던 선물을 매니저님께 전달해 드렸어요. After today's performance, it seems that there was a meeting with the cast and crew. Lots of time passed before he came out. He came out around 11 p.m. and I told him that he really worked hard. (note: it's a korean greeting like, "well done!" or "great efforts!" ^^) And I gave JH's manager all the presents that I gathered earlier. 이번에도 역시 환한 미소로 일일이 모든 분들께 악수를 다 해주셨구요. 카마엘을 위해 사진 한장 찍어 올리라고 하셨구요. 그래서 차에 앉아 계신 상태로 한장 찍어 왔습니다. Oppa called me over very kindly and said for me to take a picture of him to post for Camael. That is why I took a picture of him while he was still sitting in his seat. 오늘 오셨던 카마엘 식구들도 모두 수고 많으셨습니다. I'm sure he's very tired from working on the musical, but he always "Shya Bang Shya Bang-ly" greets and meets with Camael^^ and I thank him for this. And for all our Camael family that made it to the musical tonight, you all did great/made great efforts too. 아직 나오지 않은 것 같구요. 어쩌면 내부적인 사정으로 비공개로 가실 수도 있다고 하네요. “To be, or not to be – that is the question.” Hamlet agonized himself whether to fight against harsh fate or to live a life surrendering to lies. Hamlet, one of the tragedies written by the great English writer William Shakespeare, is a classic everyone may have ever heard of or read at least once. Hamlet, the tragedy, has a background of Danish royal family 400 years ago, and the hero of the tragedy, Hamlet had raised wrath and revengeful thoughts, seeing his mother marry his uncle who murdered his father. But who can really sympathize with the life of Hamlet in such an unusual situation? We can only get the rough idea of it. There is a man who is experiencing Hamlet’s life with all his mind and body and expressing Hamlet’s life through songs and dances on the stage. 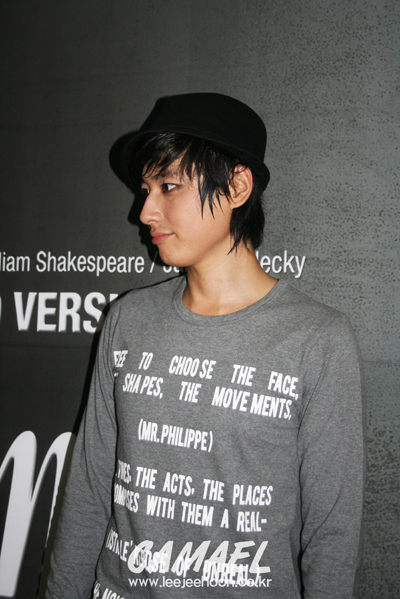 He is the singer and actor, Lee Jee Hoon. 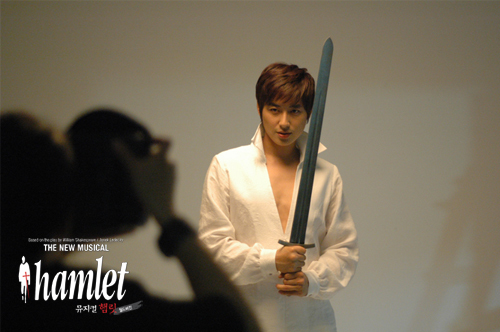 He is now holding the stage under his control as Hamlet in the new musical Hamlet. He is showing the best performance with maturity, experience and charisma which he gained from his career over 10 years. Audience kept cheering and applauding for a long time after the performance and JH is the very hero of the stage. When he got the proposal to be a Hamlet, however, he hesitated, too. “ I thought it would be too much for me to be on the stage because my schedule is too heavy. When I show a poor performance, I will be hit by arrows of disappointment as much as their expectation to me.” Besides, 4 people were cast as Hamlet. 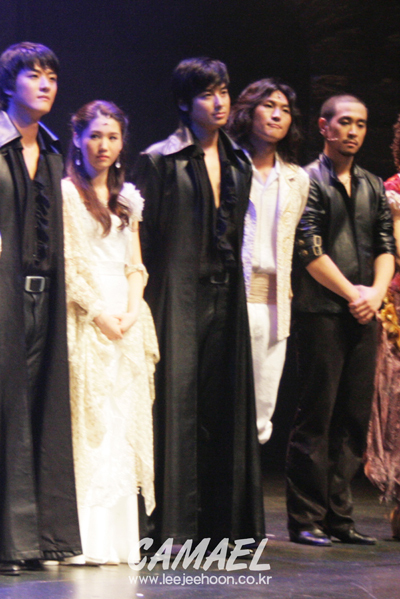 Park Kun-Hyung, Lim Tae- Kyung and Yoon Hyung-Ryol are recognized in the musical field. Lee Jee Hoon had no choice. He should show the best performance equal to them. He is preparing with such a resolution. So, he picks up an umbrella when he has time. Fencing match with Laertes, Ophelia’s brother, is a climax of the musical. “I concentrate on the fencing practice. Because the timing is very important and difficult to get.” His agent/manager is the practicing partner. 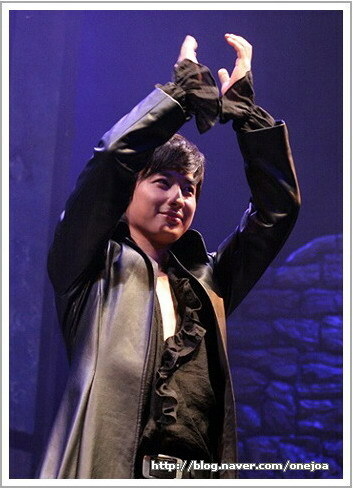 “As far as I am a singer, I hope to impress audience through songs in the musical where songs can stand out remarkably. Music in the musical is an axis which leads performance. Songs are the lines which convey emotions and do the communication. The vocalization of ballads, the genre of most of my songs, is that of drawing inward. So, I am not ready to throw my voices outward whether it is low or high. That is why I got to be pointed out that I sang like a pop singer when I sang musical songs at first. But I am better now,” he affirmed. “I can’t forget the thrill and the feeling which I felt and made me shudder at the moment I came down after finishing my first performance.” “I thought I did the right thing to decide to be in this musical. I also thought that I am in character with Hamlet. At first, I worried and wondered if my new look of anger and outcry could appeal to audience because I had never showed anger and outcry. But after I did it, it served as a chance for me to find a new aspect of myself,” he diagnosed. “I once turned my eyes to Laertes for a moment, because I shed tears whenever I hear the musical songs which Ophelia and Laertes sing together. But Hamlet is the best. There is no character like Hamlet. Hamlet is a prince, above all,” he laughed mentioning prince again. Lee Jee Hoon gave his word, “I will make up for the insufficient or weak points and show you all I have at the last performance." Recap of Last Friday's Hamlet! Not surprisingly, JH gave a tremendous performance!! And after the musical ended, they waited a long time before JH came out.. He was wearing the "training/track" suit he wore at the Japan fanmeeting..
him on the way down..
Singer and actor Lee Ji-hoon (You’re My Destiny, Hello! Miss) is wrapping up his role of the Prince of Denmark in the musical production of Hamlet and had a few thoughts on the experience playing one of Shakespeare’s most memorable characters. 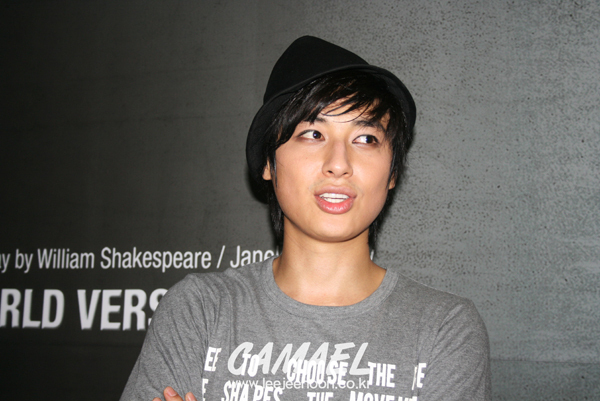 The role of Hamlet is actually being shared among four actors; Lee Ji-hoon alternates with Park Gun-hyung, Im Tae-hyung, and Yoon Hyun-ryul. 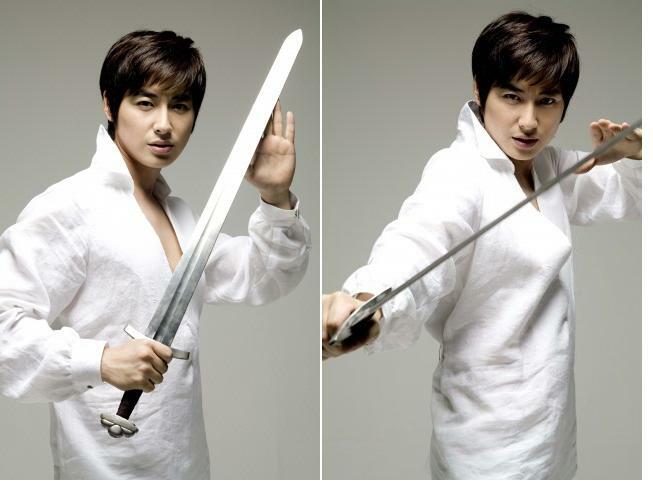 Currently, he’s spending his free time practicing his sword skills, particularly for his fight with Laertes, since timing is the most important aspect in the fight choreography. Lee explains that he’d always wanted to do a musical, having begun his singing career more than ten years ago and now enjoying a television acting career: “I want to show people yet another side to me that hasn’t been shown before. I want to try new things and be recognized for them.” With the curtain about to come down on the production, Lee hopes he’ll be able to correct all his previous flaws in his last performance. Hamlet is currently running and closes on September 21. 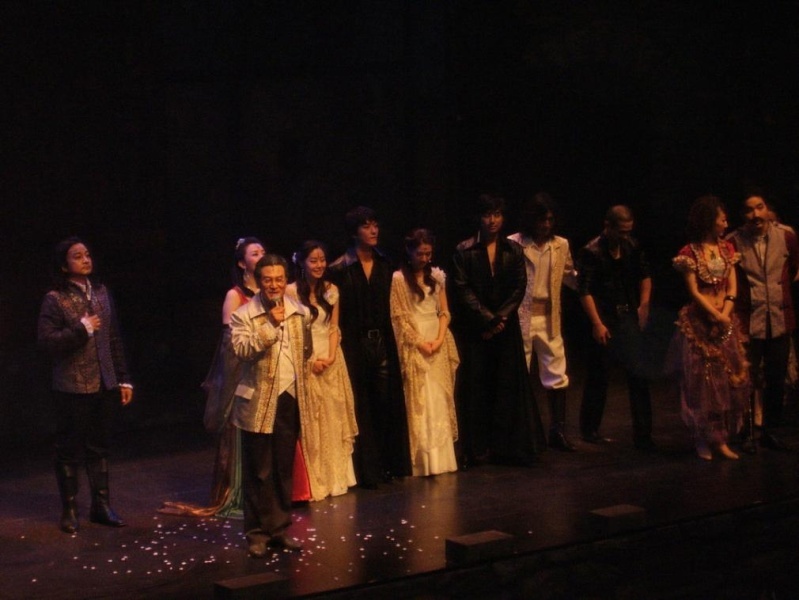 Recap of 3rd Oct 2008 Hamlet! JH will rest on Saturday, but will have another two performances on Sunday. Fighting!!! to the show were also greeting JH... and it was a great feeling to see them and each give the "thumbs up!" 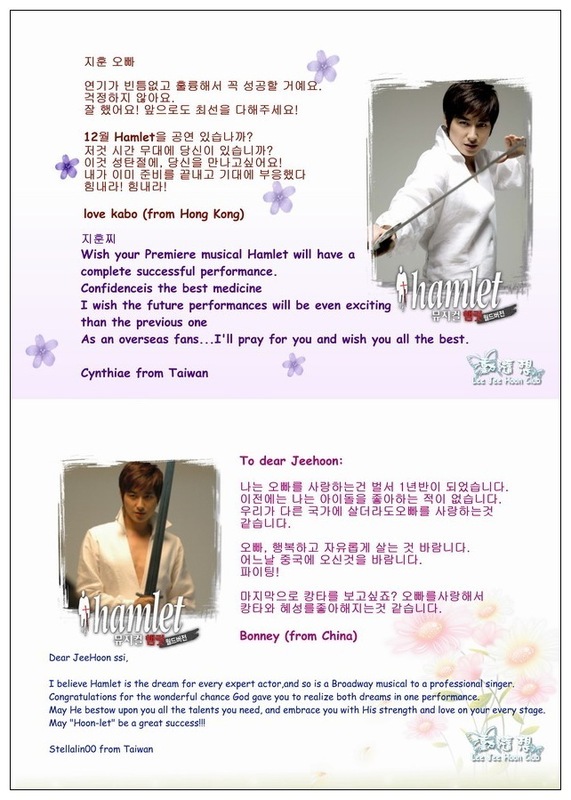 sign to JH~~ Sumi ssi felt so proud of our JH!! cost of a nice purse... but it sure is nice!! After we get married, let's go watch a show every 3 months." And "Lee Jee Hoon sure is charming!!" Whoa! JeeHoonssi really had a spectular performance! Everyone cheered! We, from this forum, are all very proud of you!! Hello! 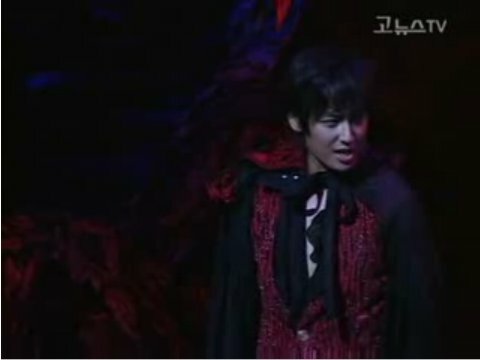 here's another video clip of Hamlet Musical.